According to the records, the first Falla to be erected in the Plaza Na Jordana was way back in 1884 and since 1954 it has been part of the Special Section (the Premier league of Fallas), longer than any other Falla. By 1983, the Fallas constructions were getting too big for the little plaza so it was decided in the interest of safety that they would be moved up the street to the Plaza Portal Nou where they have been set up and burnt down each March ever since. 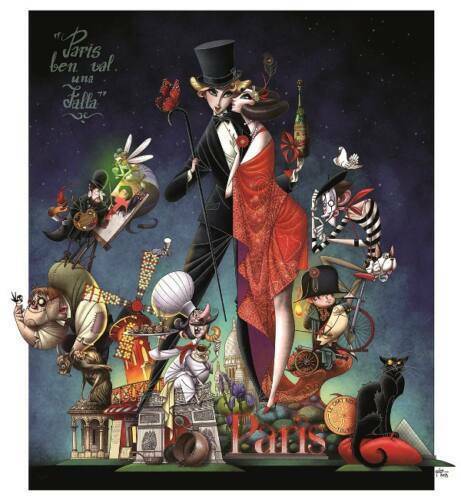 Na Jordana has won more Premios de Ingenio y Gracia (sort of an artistic merit prize given for creativity and originality) than any other Falla and has won the citywide first prize 12 times. A lifelong resident of the neighbourhood, PERE BORREGO lives just across the street from the Casal. He popped down to meet us from his first floor flat with a bunch of keys and one of those plastic cigarette substitute things “a bad time to give up smoking”. He has been a Fallero “since birth” and at four years old he was involved in the Falla´s theatre group. His father was president of Na Jordana Falla for nearly 30 years and he himself became president in 2001. Naturally every Falla has its own idiosyncrasies. In our case, the key is to mix a kind of cocktail of enthusiasm, excitement and hard work. We work systematically throughout the whole year planning and working up to the night of the burning and we work hard on the cultural activities, which keep the Falla active throughout the year. I live here and I am more than happy with our group. There are 110 adult falleros and around 40 children. Of all of those, 70% live in the Barrio del Carmen. There are those who live in other parts of Valencia but used to live here as children and whose parents still live here. You also get children bringing along their friends who may live in other parts of the city. A few years ago we bought this Casal which now belongs to our Fallas commission and will be here for future generations of Falleros. We are at the forefront of Fallas design, our “Pinocchio” monument in 1991, designed by the recently deceased Manolo Martin, was a real breakthrough in the way Fallas look and we try to keep that tradition going. We have won more Ingenio y Gracia awards than any other Falla. Personally I don´t like Fallas that don´t say anything. The whole point is that each year you´ve got to burn all the vice, the mistakes, the ills of society. Put them into your Falla and burn them in the purifying flames. Well, the Special Section is a bit like the Champions League you have to keep changing. We´ve used many great artists in the design of our monuments: Sigfrido Martin, Chema Coso…..Our search for something different hasn´t always gone down well and we´ve missed out on some first prizes because of this. Only El Pilar and Convento Jerusalem have won more than us and of course we´re the Falla that has been in the Special Section the longest. Well, we have the subscriptions that all Falleros pay. In the 50’s we were one of the first Fallas to use lottery sales as a source of income. It was a lot of work with 10 to 12,000 people all over Spain buying lottery from us several times a year. Now with the internet and the possibility of buying lottery whenever you want it’s not such a good source of income. We receive contributions from the neighbours, from sponsors and other people and groups who work with us and we have a magazine, which brings in advertising money. 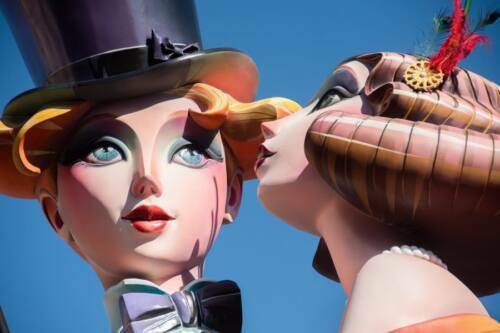 This year there was a meeting of the Special Section Fallas and we talked about fixing a limit so nobody could spend more than 190,000 Euro on a single Falla, but in the end we couldn´t come to an agreement. Some “Comisiones” will be spending 240,000 Euros on their Fallas, nearly 60,000 more than us. 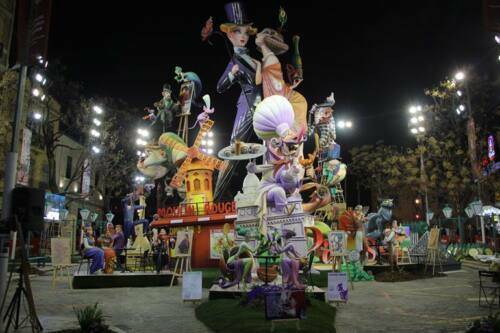 Anyone who says that knows little of the social impact of Fallas on the city of Valencia. The festival is good business for the city. It generates and circulates a lot of money. Apart from the design and construction of the fallas themselves, Na Jordana directly provides work for pyrotechnicians, musicians, the florists who provide the flowers for the “Ofrenda”, the people who print our pamphlets and magazines and those who make the dresses and traditional clothing for the falleros and falleras. The hotels and local bars and restaurants, of course, do a roaring trade but when you ask them for 20 Euros for an ad in the magazine they don’t want to know. Don´t miss the Cremá, the burning. This year the theme will certainly work well with the flames! There´s a lot of wood in the structure to make it burn slowly so it should be pretty spectacular. What I like most is the work through the year rather than the Fallas week itself. My favorite bit is the build up through the first weeks of March to the Plantá (when the Falla is put in place) and the Cremá of course. I´ll tell you something, though. On the night of the Cremá at five in the morning I like to sit on my balcony when it’s all over and quietly look down on the street, which is peaceful and empty again. Then before you know it it’s back to work preparing for next year. David Rhead and Jose Marín.